Ken Morris, Jr., great-great-great grandson of Frederick Douglass, speaking at The Walden Woods Project. Maria Madison draws parallels between the journeys of Frederick Douglass and Concord’s Ellen Garrison. 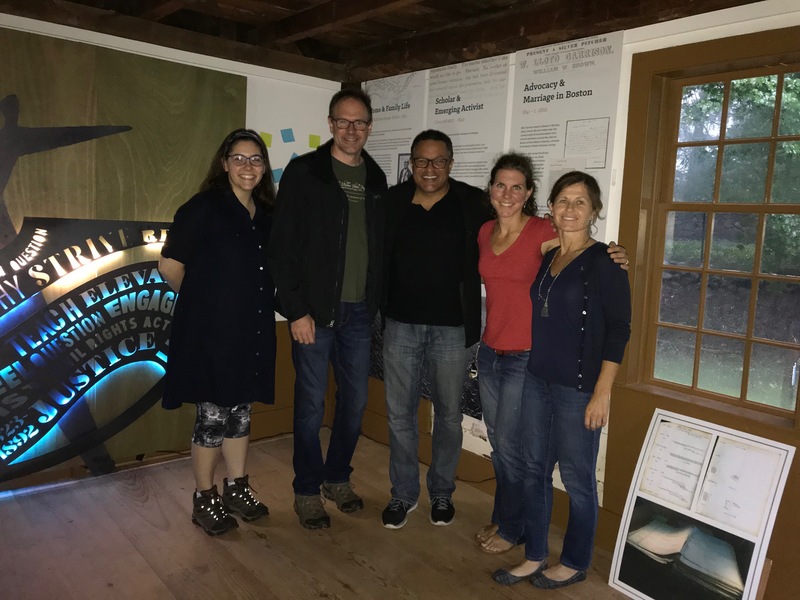 Ken Morris (3rd from left) visits the Robbins House with (l-r) Miriam Renz, Matt Burne, and Whitney Retallic of the Walden Woods Project, and Concord native Kristin Leary of Leary Ventures and Frederick Douglass Family Initiatives. 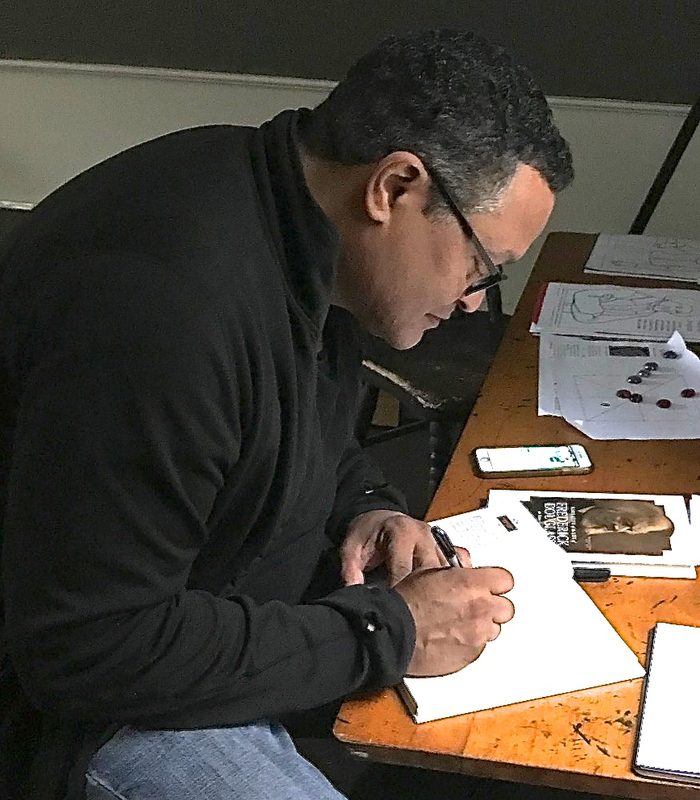 Ken Morris signs a copy of Narrative of the Life of Frederick Douglass: An American Slave for the Robbins House. Frederick Douglass visited Concord numerous times between 1841-1844 (persuaded early on by Mary Merrick Brooks, above) to spread his message of antislavery activism with stories about his own enslavement from birth to age twenty. 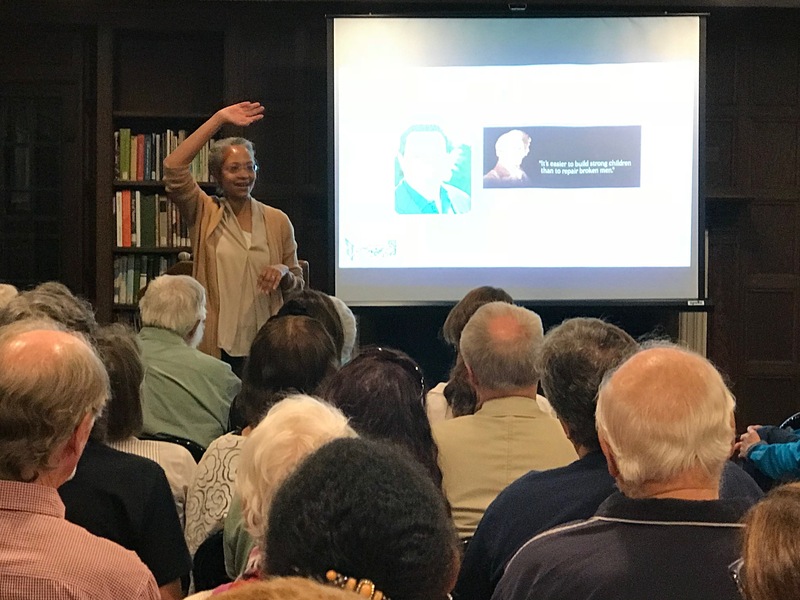 Last week Kenneth B. Morris, Jr. followed his great-great-great grandfather’s footsteps to Concord, speaking at the Walden Woods Project about modern day slavery and the power of education and awareness to end it. Mr. Morris was as inspirational and engaging an orator as his ancestor must have been, and believes they both had a calling to do their work. Mr. Morris’ grandfather Frederick Douglass III, his grandmother Nettie Hancock Washington II, and Booker T. Washington III. Photo courtesy of Frederick Douglass Family Initiatives. Ken’s extraordinary lineage flows through his mother’s family, when his grandmother, Nettie Hancock Washington II (granddaughter of Booker T. Washington, famed educator and founder of Tuskegee Institute), and his grandfather, Dr. Frederick Douglass III (great grandson of Frederick Douglass, called “the father of the civil rights movement”) bumped into each other on the campus of Tuskegee Institute and married three months later. When Ken’s mother, Nettie Washington Douglass, was born she was the first to unite the bloodlines. Ken began his career as a singer, and later became a partner at a leading marketing and entertainment firm. When Ken first heard about human trafficking, he was motivated to act because he couldn’t look his young daughters in the eyes and walk away. In June 2007, the Frederick Douglass Family Initiatives (FDFI) was co-founded by Mr. Morris, his mother Nettie Washington Douglass, and Robert J. Benz. Their mission is to advance freedom through knowledge and strategic action. Based on their experience and the opinions of leading experts in the ﬁeld, FDFI founders believe that education and awareness are the ﬁrst step to ending human trafﬁcking in our lifetimes. In 2018, to honor Douglass’s 200th birthday, FDFI will print one million hardcover copies of the Narrative of the Life of Frederick Douglass: An American Slave and give them to young people in schools across the country. They then ask the readers of this special Bicentennial Edition to create service projects to address an urgent social justice issue present in their community. 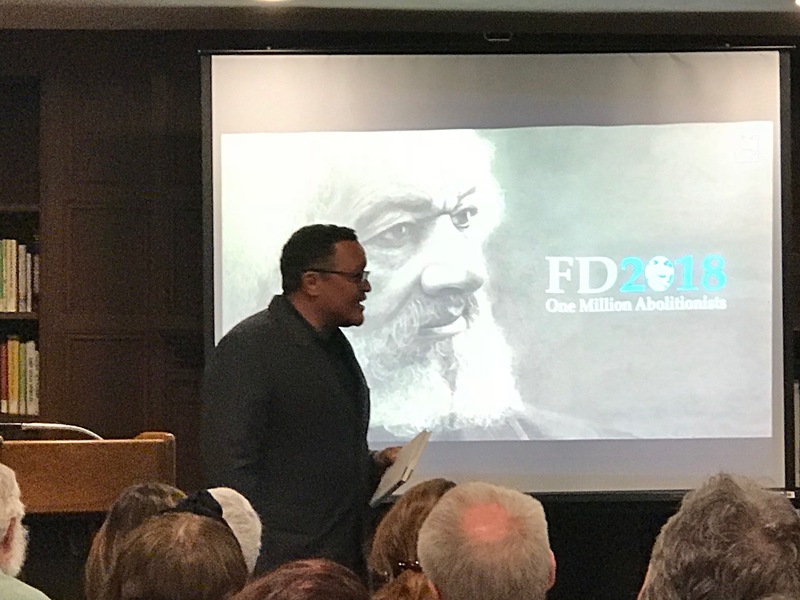 The goal of the “One Million Abolitionists Project” is to see one million young people working toward equality in the spirit of Frederick Douglass. Ken Morris, we can’t help thinking after his talk, would have made his famous ancestors immensely proud.